The towns of Ayer and Shirley, on Massachusetts' northern border, faced precipitous student enrollment declines as a result of the closure of the Fort Devens military base a decade ago. The two towns came together to form a new district and share resources, and also to maintain a critical enrollment mass. With many students opting to attend out-of-district schools, a simple face-lift renovation would do little to change the current educational culture. Whereas the original 1960 building once housed over 1,000 students, the new grade 9-12 population is planned for 460 students. The Massachusetts School Building Authority had prescribed a combined middle and high school, to increase the total population. SMMA convinced the communities to rethink the logic of this assumption by thoroughly analyzing the physical attributes of the building, and then stepping back and master-planning the District’s entire portfolio of schools. By treating the site as a campus, open pathways and connections are formed from early education through grade 12. Understanding the building’s physical attributes and their potential impacts on learning was a key to creating a true 21st Century plan concept. The result saved the state and communities over $20 million, while allowing for a fully transformative and comprehensive solution. 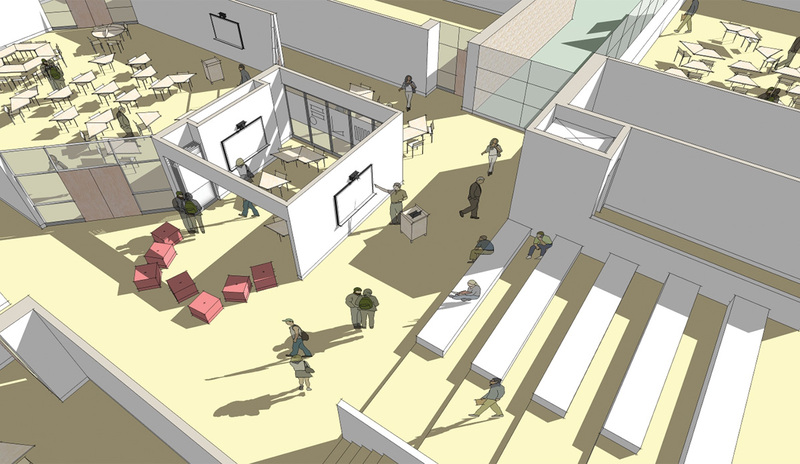 Small, undersized spaces on eight distinct levels, separated by narrow corridors and an underutilized open air courtyard, with isolated community use spaces and tiny lobbies, divided the student body and after-hours public uses, making the building hard to navigate and supervise. The poor condition and environment led to over 100 students choosing alternative, out-of-district school options. We aimed to maximize opportunity for pupil and adult interactions, incorporating corridor learning commons; teacher planning centers; small group rooms and larger flexible classrooms, with four teaching surfaces; and flexible, mobile furniture systems into our design. The building has remained occupied during construction, requiring careful shifting of spaces to allow for seamless, uninterrupted education. Program integration and collaboration, that was previously unavailable, will now be a daily element in teacher and student life. Ultimately, the floor-to-floor height and other physical building conditions limited our ability to create dynamic disciplinary adjacencies, and necessitated the demolition of the wings. These studies provided guidance and direction for the eventual new classroom pod plan concept later developed with educators and staff. A small school population and the ability to shift program areas have enabled fully interconnected educational courses of study, centered on a large group instructional space and media center. STEAM is now a possibility via the additions of a TV studio, and music and humanities classrooms, and by taking advantage of changes in topography, corridors now have expansive student-gathering opportunities. The new main entrance—once the former loading dock and service court—now faces west, an environmental improvement allowing for a campus-like relationship with the Page Hilltop Elementary School. The entry court creates a comfortable gathering spot for students to have lunch or meet up before and after events. A sculpture court also allows for students to express themselves artistically. The entrance connects to the public activity space, including the community TV studio—with windows and LCD monitors to communicate school and worldwide events, taped or in real-time. Ayer Shirley RHS is now 2/3 through construction, and each phase brings new revelations. The communities have celebrated each transition, and our work has been recognized with an Ed Kirkbride Award, the Northeast Regional Chapter of the Council of Educational Facility Planners International’s highest honor.